1Brussoni M, Gibbons R, Gray C, Ishikawa T, Beate E, Sandseter H, Bienenstock A, Chabot G, Fuselli P, Herrington S, Janssen I, Pickett W, Power M, Stanger N, Sampson M and Tremblay MS. What is the Relationship between Risky Outdoor Play and Health in Children? A Systematic Review. Int. J. Environ. Res. Public Health 2015, 12, 6423-6454. https://www.ncbi.nlm.nih.gov/pubmed/26062038-accessed July 24, 2017. 2Jago, R.; Thompson, J.L. ; Page, A.S.; Brockman, R.; Cartwright, K.; Fox, K.R. Licence to be active: Parental concerns and 10-11-year-old children’s ability to be independently physically active. J. Public Health. 2009, 31, 472–477. In Brussoni M, Gibbons R, Gray C, Ishikawa T, Beate E, Sandseter H, Bienenstock A, Chabot G, Fuselli P, Herrington S, Janssen I, Pickett W, Power M, Stanger N, Sampson M and Tremblay MS. What is the Relationship between Risky Outdoor Play and Health in Children? A Systematic Review. Int. J. Environ. Res. Public Health 2015, 12, 6423-6454. https://www.ncbi.nlm.nih.gov/pubmed/26062038– accessed July 24, 2017. 3Kalish, M.; Banco, L.; Burke, G.; Lapidus, G. Outdoor play: A survey of parent’s perceptions of their child’s safety. J. Trauma 2010, 69, S218–S222. In Brussoni M, Gibbons R, Gray C, Ishikawa T, Beate E, Sandseter H, Bienenstock A, Chabot G, Fuselli P, Herrington S, Janssen I, Pickett W, Power M, Stanger N, Sampson M and Tremblay MS. What is the Relationship between Risky Outdoor Play and Health in Children? A Systematic Review. Int. J. Environ. Res. Public Health 2015, 12, 6423-6454. https://www.ncbi.nlm.nih.gov/pubmed/26062038-accessed July 24, 2017..
4Alparone, F.R. ; Pacilli, M.G. On children’s independent mobility: the interplay of demographic, environmental, and psychosocial factors. Child. Geogr. 2012, 10, 109–122. In Brussoni M, Gibbons R, Gray C, Ishikawa T, Beate E, Sandseter H, Bienenstock A, Chabot G, Fuselli P, Herrington S, Janssen I, Pickett W, Power M, Stanger N, Sampson M and Tremblay MS. What is the Relationship between Risky Outdoor Play and Health in Children? A Systematic Review. Int. J. Environ. Res. Public Health 2015, 12, 6423-6454. https://www.ncbi.nlm.nih.gov/pubmed/26062038-accessed July 24, 2017. 5Position Statement on Active Outdoor Play. Herrington S and Pickett W and: the BC Injury Research and Prevention Unit, CHEO Research Institute, Physical Activity Epidemiology Lab, Best Start, KidActive, Play by Nature, Child and Nature Alliance, Centre de Recherche Institut Universitaire de Cardiologe et de Pneumologe de Québec, Queen Maud University College of Early Childhood Education, Canadian Parks Council, ParticipAction, Evergreen and PHE Canada. http://www.haloresearch.ca/outdoorplay/-accessed July 24, 2017. 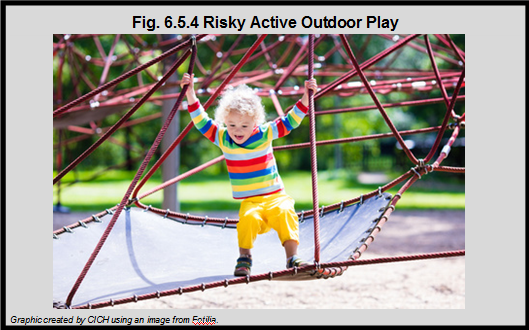 What is risky outdoor active play? It is not play that puts children at extreme risk “like skating on a half-frozen lake or sending a preschooler to the park alone”.